Early in 1609 a leading Renaissance explorer, mathematician and natural philosopher turned his recently acquired optical device skywards to study the surface of the Moon. The observations he recorded are the first ever to be made with a technology that could extend the natural resolution of the naked eye. The observer was a relatively little known Englishman called Thomas Harriot (ca 1560 - 1621). Just a few months after Harriot made his observations, the much better known Renasissance natural philosopher Galileo Galilei turned his telescope to look at the surface of the moon and recorded what he saw. Harriot and Galileo were not the first astronomers, but they were the first to show how the naked eye could be definitively outclassed in observational power by an eye that was equipped with a magnifier. Although measurement per se is thousands of years old, Harriot was the first to use measurement in a distinctively modern and scientific manner. Scientific measurement is defined by the use of specialised instruments that extend our innate human capacity to resolve differences. In the case of the telescopes used by Harriott and Galileo the improved resolution led them to see features on the surface of the moon that simply could never have been seen before by human beings. Improved optical resolution led directly to scientific discovery. The pursuit of resolution drives science on today. The Large Hadron Collider search for Higgs Boson and the Map of the Universe are examples. 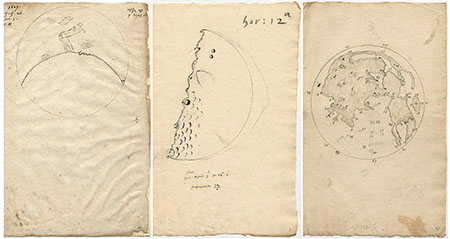 Within a matter of months of each other, and completely independently, Thomas Harriot and Galileo began the scientific study of the surface of the moon, more broadly observational astronomy and also scientific measurement. Although Harriot has priority over Galileo for this landmark in human history, he did not publish his observations as rapidly, coherently and comprehensively as Galileo did. Thomas Harriott was known by his contemporaries to be both brilliant and seemingly uninterested in claiming priority for his work, much of which was later re-discovered by others. He left a disorganised but rich legacy of work in optics, astronomy, exploration and mathematics. It is only over the past few decades that a fuller appreciation has developed of the quality of his scientific and mathematical work. A taste of more recent scholarly interest in Harriot can be gleaned from the articles and bibliography in the volume edited by Robert Fox Thomas Harriot and His World: Mathematics, Exploration, and Natural Philosophy in Early Modern England.